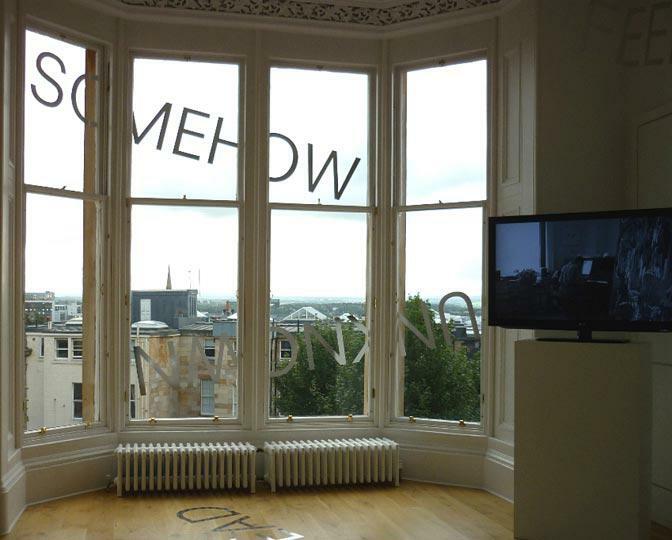 Robert Barry’s solo show Words and Music at The Common Guild in Glasgow is simple and serene. 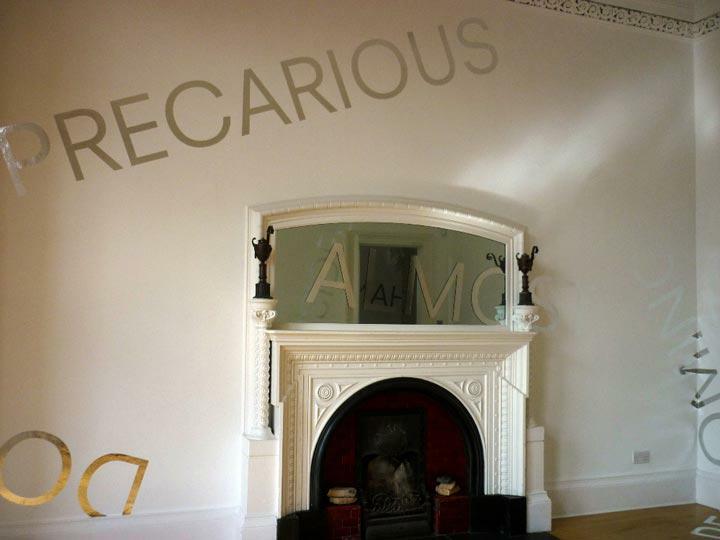 A careful selection from Barry’s growing collection of words has been applied seemingly haphazardly over the windows, ceilings, walls and floors of this once domestic space to create one of his well known ‘word spaces’. 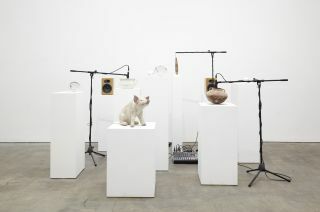 Barry abandoned painting in 1967 to produce site-specific installations that at their most extreme are invisible (like his works that were produced using radio waves and telepathy). 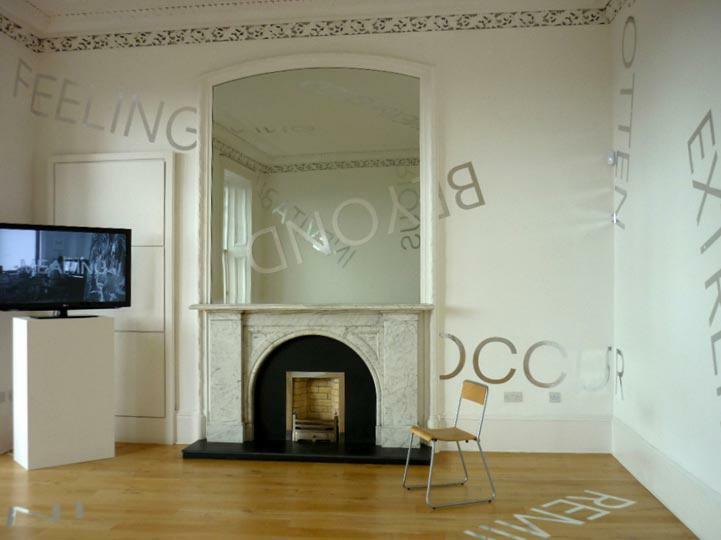 In these ‘word space’ installations the work is again visible, in this case the words are rendered using a special double-sided silver mirror-finish vinyl. Accompanying these words is music from a new video work featuring fellow American artist William Anatasi. The video shows Anatasi playing the piano in a painting studio never turning to face the camera. As he plays, Barry’s words are overlapped on the screen. 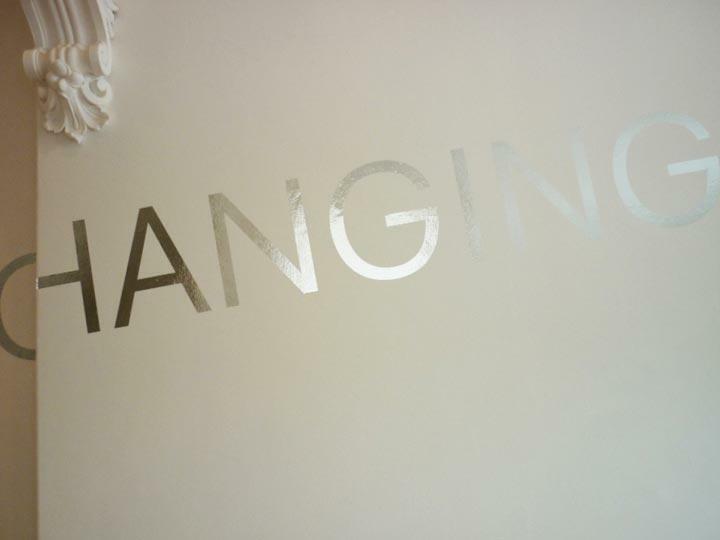 But these words are a cut out of another video, showing traffic passing and daily life, yet the words and scenery reveal no narrative. This is not a performance in the sense of recital; mistakes are made, notes are repeated and normality is emphasised by the shaking hand of the cameraman. Imagine walking into a room with a man playing a piano and he hasn’t noticed you. The street scenes viewed through the projected words mirror the banality of Anatasi playing. 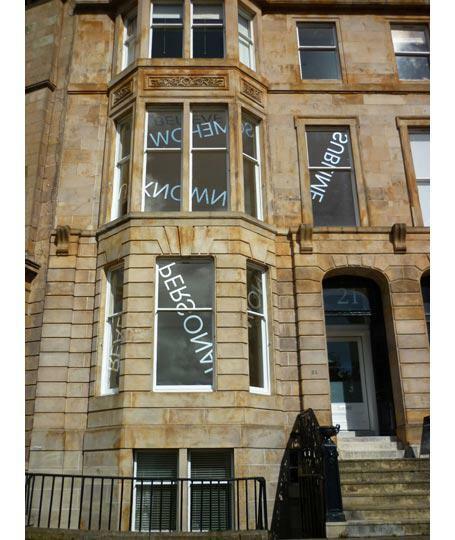 They merely act as a window from one empty space to another. 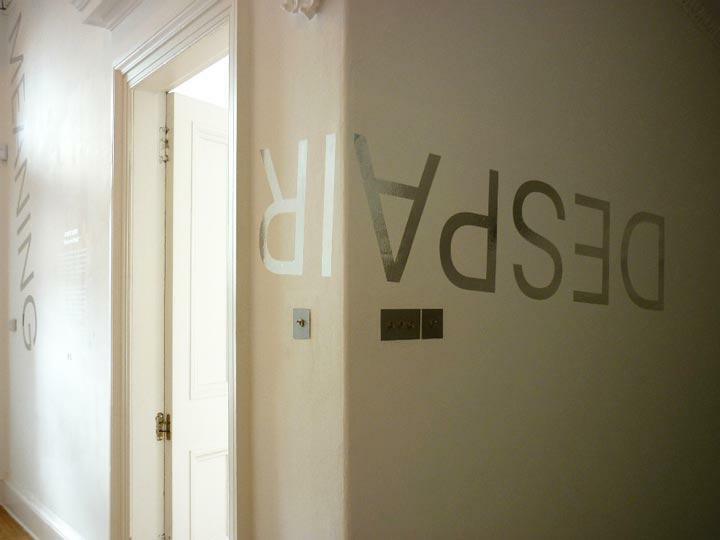 This video work recognises Barry’s previous invisible works as it spirals down the staircase filling the gallery with a physicality that remains delicate and tenuous. Yet the music refuses to intervene in the ‘word spaces’ and refuses to direct the audience’s interpretation. 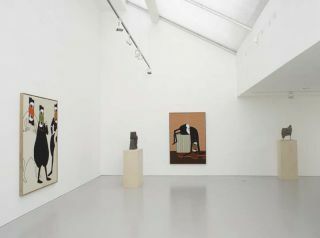 Perhaps it is the removal of Barry’s work into a former domestic setting, rather than a white cube, that domesticates the words and our interpretations. The original features; the fireplaces, the mirrors, the bay windows, the coving detail - all of these are not hidden from view, but emphasised. 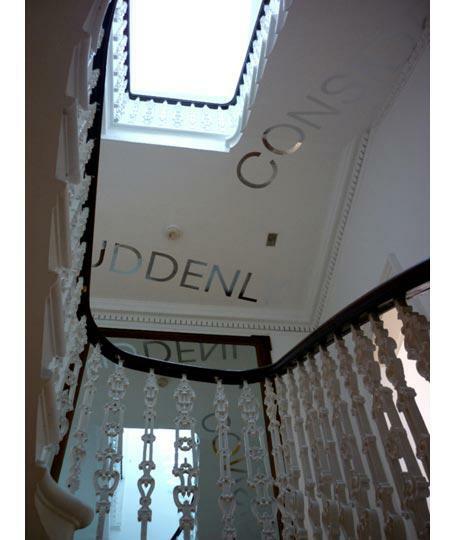 The lettering, when overlapping a feature, becomes invisible, as if the words existed first and then the building filled in the spaces. We fill in these gaps and whether to choose to come to any conclusion. These words mean nothing. They are physical and visible. But when the audience is invited to look at them, to sit in their space and absorb Anatasi’s piano, only then do they take on a personal meaning. 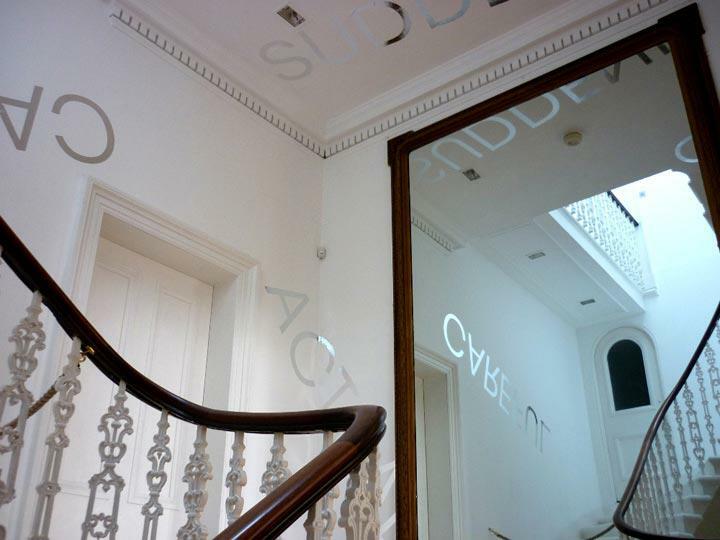 The words physically reflect their surroundings and us, but it is only a mirror-finish. As Barry notes, ‘Instead of trying to use text to convey an idea or meaning, I became interested in the individual power of the word to convey emotions or feelings’. 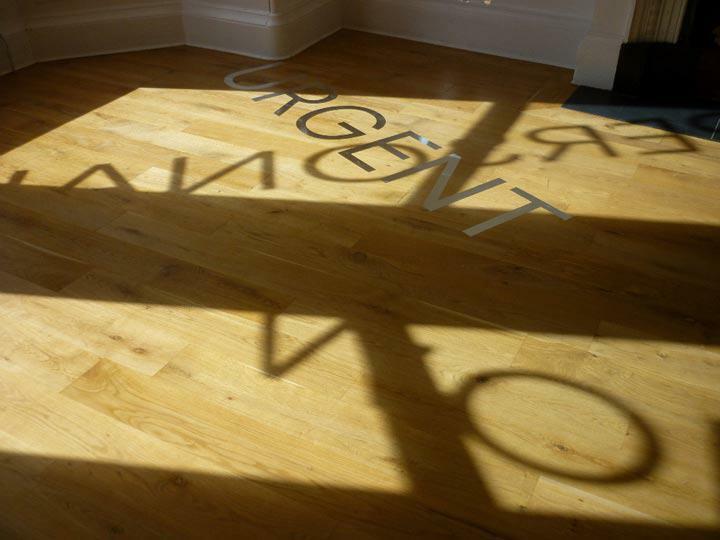 My understanding of the words creates my own narrative; they are released into the space and exposed in front of me.